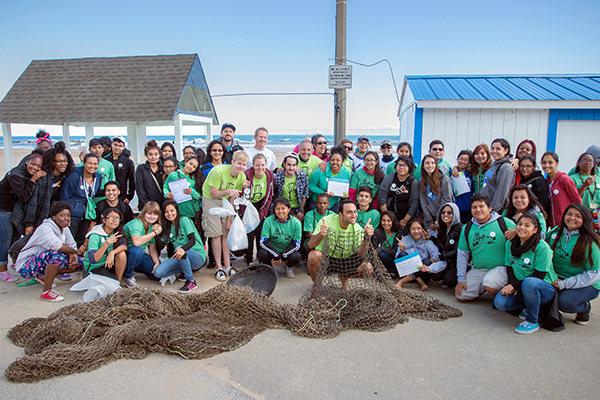 To celebrate the beginning of another Adopt-a-Beach season, we’re looking back at all the hard work Adopt-a-Beach volunteers and team leaders put in last year. Keeping Great Lakes beaches and shorelines beautiful is no small task, and it couldn’t be done without the incredible efforts of Great Lakes fans all over the region. The 2016 Adopt-a-Beach season had an incredible turnout — more than 15,000 people participated in cleanups all over the Great Lakes. Volunteers recorded every single piece of litter they picked up and submitted the data into our online database. The data volunteers collect is part of a huge set of data compiled from over a decade of cleanups. And, it’s a valuable resources for researchers. It’s larger than what any one scientist could collect on their own! The information can help to identify problem areas and develop solutions to improve beach health. Adopt-a-Beach volunteers know better than anyone that cleaning beaches could be a round-the-clock job. In fact, in 2016 alone 15,181 volunteers logged nearly 35,000 hours of work at 1,388 unique cleanups. That’s 1,458 days, or four years! You can get a lot done in a cumulative 35,000 hours, and Adopt-a-Beach volunteers and team leaders wasted no time. By the end of the season, they picked up a whopping 40,000+ pounds of litter. Composition of Beach Litter: What’s in the Garbage Bag? Adopt-a-Beach volunteers and team leaders recorded what kind of litter they picked up, which gives insight into the most common and problematic types of litter. The majority of trash picked up by Adopt-a-Beach volunteers in 2016 was plastic — 87% plastic, to be precise. Plastic is problematic for a number of reasons. In addition to being an eyesore, it can harm the lakes and animals that live in them. Over time, plastic litter breaks down into small pieces which can be eaten by birds, fish, and other wildlife. 2016 marked the Adopt-a-Beach program’s 25th anniversary. That means 25 years of clean beaches and shorelines all over the Great Lakes. More importantly, it means 25 years of hard work from people who love the Great Lakes and want to make them better. Their small actions have led to an enormous impact — an impact you can be a part of. All you have to do is find a cleanup near you and head to the beach. Or you can lead your own cleanup by becoming a team leader. Thank you to all the volunteers who made a difference at their local beaches and made Adopt-a-Beach 2016 a huge success. Here’s to another great year — see you on the beach! Hit the beach with us this summer. Find an Adopt-a-Beach event near you and make the Great Lakes more healthy and beautiful.